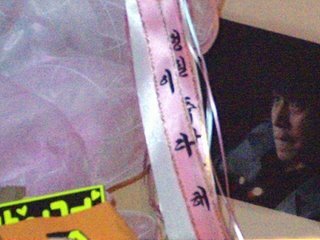 The birthday party For Lee Dong Wook on 11/05/2006 was awesome!!! I really enjoyed this year’s party more than last years, since it was only for a smaller audience. 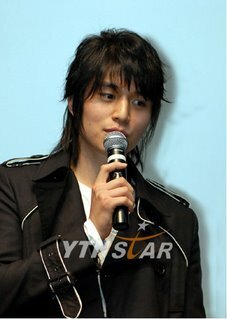 MC for the party was one of Lee Dong Wook’s close friends, Jung Joon Ha. Lee Dong Wook finally came on the stage, after KCM’s songs. He looked really happy and pleased to see so many fans came to celebrate his birthday. He also looked very comfortable with fans– he talked a lot with them. The first game he did was called “Golden Bell” which asked the 15 fans who had been pre-selected and joined Lee Dong Wook on the stage questions until there was only one person left on the stage. Questions were like – what is the name of Lee Dong Wook’s character in My Girl, what is his shoe size, what is the name of his pet, when was the date of his debut, what was the name of his debut work, what was the name of his role in that work, how do you write his name in Chinese, and so on. As you can see in the picture, Lee Dong Wook gave a stuffed animal to the winner, took a picture with her and gave a hug!!! Next, Lee Dong Wook’s another close friend, Soo-Ho joined him on the stage. Soo-Ho wanted and made everyone stand up, so they all stood up. After this, we took a moment for a brief survey and questions! Next was the time for the birthday cake!! Lee Dong Wook typed all the things he wanted to say on keyboard so that he could share with everyone. However, since he couldn’t type well—probably he was too nervous, the MC was teasing him!!! After this, it was time to open the gifts. I personally didn’t really plan to bring any extravagant present, but on the way to the party, this brilliant idea—a box of So-Joo (Korean Sake) came into my head. I put our website URL on each bottle. Hyun-Young who is in the movie Choi-Kang Romance with Lee Dong Wook helped him opening the gifts. They were walking around the room and spotted the box of So-Joo!!! The MC said, “Is it really So-Joo?” trying to pick up the box. But he couldn’t lift it up, instead he said “It seems it’s really So-Joo.” Lee Dong Wook must have heard it and came to the box, starring at it for a long time before he went to another table to open more gifts. He opened almost every gifts were on the stage, including those sent to him from China and Japan. He was so kind and friendly throughout the party. He answered all the questions that we asked. Before it was over, he sang a song for us. He looked very attractive and handsome. Someone asked him to shake everyone’s hand before we leave the room, but because there was another event scheduled—we had to empty the room quickly. He and his manager apologized for this un-granted (?) wish. I’ve tried to be more detail and specific in writing this, especially for those who couldn’t attend the party. Please watch and enjoy the video clips from the party. Thank you. Since LDH didn’t attend Wookie’s birthday bash, fans were speculating whether she sent him a present or not. Well, speculate no more! 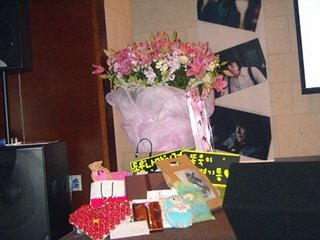 As there were a lot of presents in front that bouquet of flowers, Da Hae’s name was therefore hidden behind! Did Dong Wook oppa bring the flowers home? Did he keep it nicely in his room? It’s not easy to bring back such big bouquet of flowers..really wish that those flowers would never die..I guess Miss Da Hae’s love towards Dong Wook oppa is as huge as the flowers! doozy: Haha! Wookie wanted to know where the booze came from… He’s so funny. I’m glad that he had a good time at the party. Although, I had issues with his answer regarding the friendship/love question because it hit on one of my pet peeves; I hate when friends ditch you for their girlfriends/boyfriends. Nonetheless, Wookie’s still cool in my eyes. 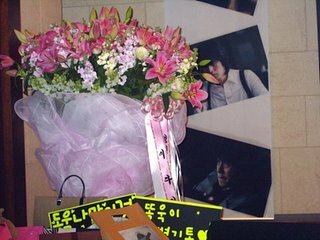 Aw, and it’s nice of LDH to send him that beautiful bouquet of flowers! I wonder if the ribbon that is hidden behind the one with her name on it says “You’ll be blessed.” That would be hilarious. Kind of like an inside joke, the My Girl connection. Heehee. LDH is a sweetheart. It’s nice to know that they’re still friends after My Girl. This entry was posted in News and tagged Lee Dong Wook by doozy. Bookmark the permalink.